At the microphone, Fairfield resident Sue Olsen expresses frustrations with flooding on Littlebrook Road at a meeting on Nov. 29, 2018. The meeting covered the topic of flooding from a storm on Sept. 25, 2018. FAIRFIELD — After severe flooding impacted homes along the Rooster River in September during a storm, Fairfield officials said Thursday there will be a hydraulic analysis of the river in 2019. 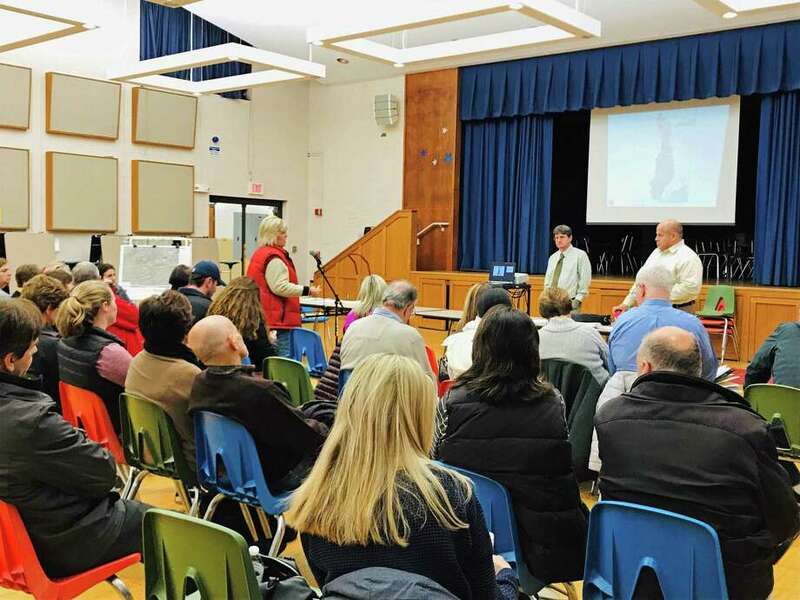 Joseph Michelangelo, Fairfield’s director of public works, announced the analysis by the United States Geological Survey and Federal Emergency Management Agency at a meeting Thursday evening at North Stratfield Elementary to a crowd of about 50 residents. The residents gathered in the all purpose room of the school to discuss the immense flooding that slammed Fairfield and Bridgeport earlier this year. On Sept. 25, a storm slammed the region, dropping 6.8 inches of rain in the area of Cartright Street, Dora Circle and Renwick Drive in Bridgeport. On the other side of the Rooster River, Fairfield was hit with about 7 inches of rain. But Michelangelo explained why the Sept. 25 flood was different from others. “We saw a lot of rain in a few short period of time — just over a few hours,” Michelangelo said. Just as quickly as the waters came up that day, they receded, leaving Bridgeport and Fairfield residents to clean up the mess. Some residents in Bridgeport had to leave their muck-covered homes damaged by the storm, lost their cars and lost their pets. In Fairfield, cars and homes were flooded. Many residents, on both sides of the river, blamed at least some of the flooding on the Rooster River. After the storm, Michelangelo said, the town had crews out immediately to check on the damage and start to brainstorm plans for what could be done. And about two months later, town officials had some answers for residents. “The entire line was surcharged. It couldn’t handle any more,” Michelangelo said, then explaining the impact of the storm on the drainage system as a six lane highway merging into a three lane highway. Michelangelo called the design of the drainage systems throughout town as inefficient. But, he said, there wasn’t just one problem that September day; many factors contributed to the extensive flooding. Instead, he said, his department is looking at strategically addressing the problems. And to help the town focus on appropriate fixes, Michelangelo said, Fairfield has hired an outside engineering firm — Milone & MacBroom — to help assess what can realistically be done. Olsen asked Michelangelo and Bill Hurley, Fairfield’s engineering manager, if the town was looking into any interim solutions. Though there weren’t immediate ones immediately ready to be launched, Michelangelo said different water storage options were among the possible solutions for Fairfield. Michelangelo and Hurley told residents below-ground storage of water that can be released at a steady rate during storms is something they’re seriously considering, specifically at the Fairchild Wheeler Golf Course. The town hopes to roll out some changes and expect finalized projects to begin in the spring of 2019. Before any changes begin, officials said, the town will make sure it’s what residents want. Like the Fairfield residents, about 50 Bridgeport residents gathered last month for a forum on the flooding the city saw that September day. Residents expressed their concerns and frustrations about the flooding and what had — and hadn’t — been done to help the city snap back after the storm. Michelangelo said the town is working alongside Bridgeport and Trumbull to figure out what can be done that won’t impact other areas nearby. For now, that means cleaning what they can, while the wheels continue to turn behind the scenes.